First, what is a racquet tag? A racquet tag is that little “sticker” that is placed on the inside of the racquet shaft. OK, who needs them? For sure, I do and, I think you do too. That little sticker contains information that is useful for you because it tells you your name, in case you have had a really bad match, it tells you the date the racquet was strung, it tells you the string and the tension that is used. On my tags there will be a phone number just in case you want to call after winning and tell me how good the string is! Or not! Included on the the tags that are generated by my software, Racquet Record, will be a racquet number. This is the number specific to that racquet and is automatically assigned as the racquet is entered into service. Each time the racquet is strung a new database is created and all the wonderful information is recorded. Simply by scanning this number into my database I can have the exact racquet work order ready to go. On the racquets I do there will be yet another tag! This is a bar code. 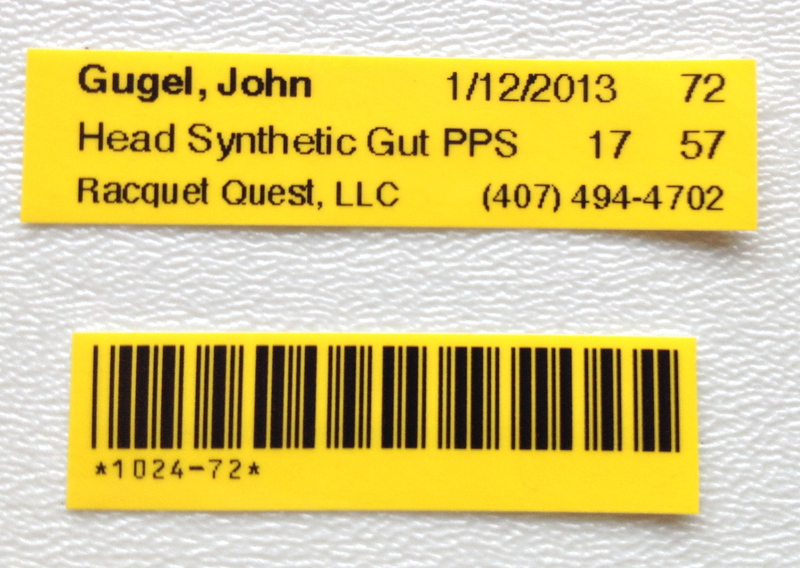 As with any bar code this can be scanned to retrieve the proper racquet. It is also human readable. So, if you simply must remove the “label” please consider leaving the bar code in place. This really helps…both of us! This information is critical to me and to you, I believe, because each time a racquet is submitted for service you will be assured the specifications are current and can be compared to reveal any degradation of the racquet over time. So, before you rip off that “sticker” think about how it can be important information that you can use to get the most from your racquet. Posted on February 25, 2013, in Good News!. Bookmark the permalink. Leave a comment.